Simpsons, Simpsons everywhere! 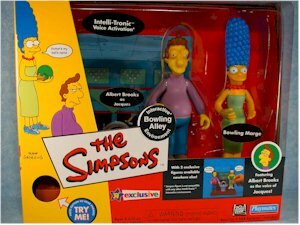 With the third Treehouse of Horror hitting at the end of last week, and the new Toys R Us exclusive Marge and Jacques set (at the Bowling Alley) hitting this week, there's plenty for WOS fans to be searching for. That doesn't even take into account the Main Street set that should be hitting soon as well, and the new School Bus that has started to pop up. In the world of WOS, it always seems like feast or famine. 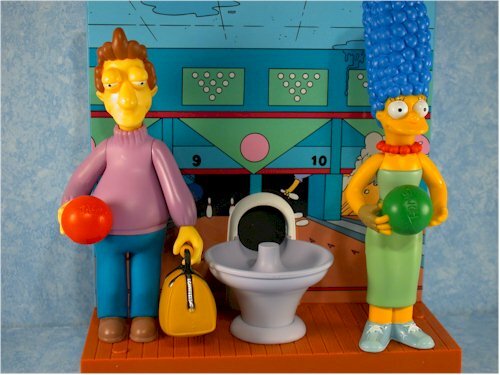 This set is based on the episode "Jacques to be Wild", in which Marge took some bowling lessons from the amorous Jacques. The set is a TRU exclusive, and is retailing for about $30. Same story that you've read plenty of times before. The packaging looks decent, with attractive graphics and solid text, but it's nothing to jump up and down about. 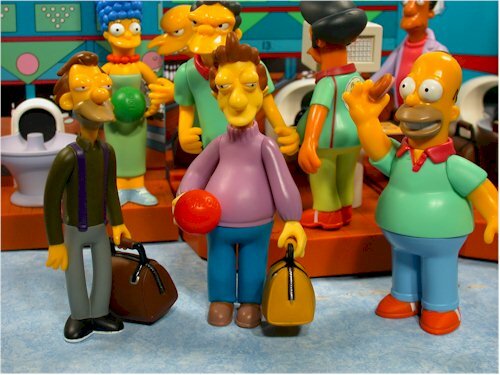 The sculpting is great on Jacques, and decent on Marge. 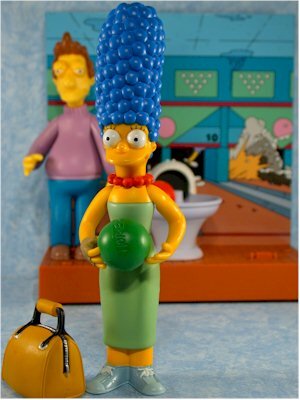 The Marge sculpt is pretty much the same as the first series Marge, but the bowling glove and bowling shoes are new. Jacques is a terrific sculpt, both body and head. He's in scale with the rest of the line, and his expression captures the character perfectly. And now we have two characters in sweaters! For a scale picture, check out the very last photo on the page. Another plus on the sculpting of both figures is the hands and arms. Due to the limited articulation, it's important to sculpt the arms in such a way as to give you some posing options. 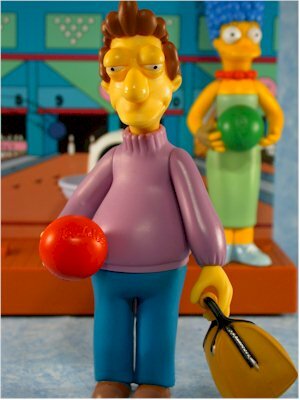 They managed to do that with both figures, and the hands are sculpted to hold the bowling balls perfectly. The paint ops on both the figures and playset look good. No slop, no inconsistencies, and very little overspray. Every line isn't perfect, but it's above average. You should watch the eyes on Jacques though. Mine were fine, but I suspect that if the pupils aren't just right he'll come out looking a bit goofy. 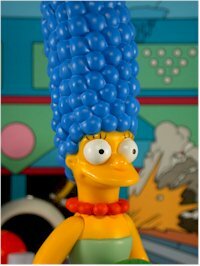 Marge's head also appears to be made from the shinier plastic...hmmm. Another one of those same story, different figures sort of thing. Neck, shoulders and waist. The accessories on this set are light - only two bowling balls and the ball bag. All are technically re-uses. The ball bag is a repaint, and looks pretty good. 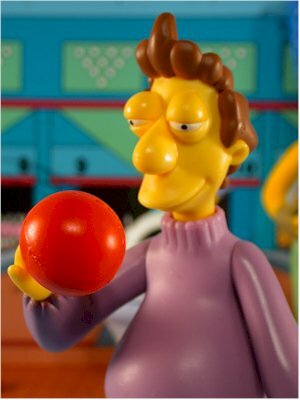 Both balls are also painted to match the episode colors, and both have the appropriate names inscribed on them - Homer on the green ball, and Jacques on the red ball. The simple fact that they inscribed these balls with the names elevates the accessories a solid star or more. Adding in show specific touches, rather than just reused existing accessories, is crucial to making the set a hit. Hallelujah! It appears that our major issue with the pegs just might be fixed. Both Jacques and Marge fit on the pegs perfectly, with no issues at all. Jacques: "There are ten pins in my heart - you've knocked over eight", "I can teach you everything", "Do you know how beautiful you look in the moonlight? ", "My mind says stop, but my hips cry proceed! ", "Your fingers are so slender". Marge: "Where do I throw this? 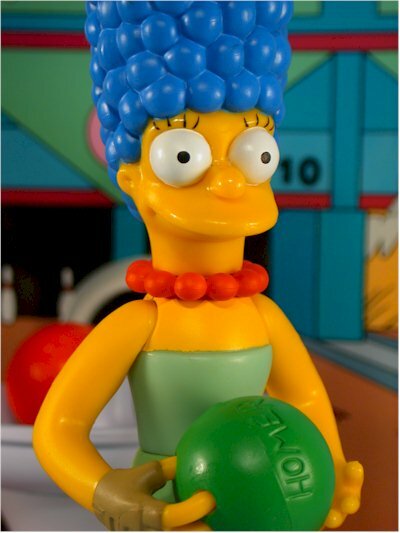 ", "Homer's my ball's name", "I'm a married woman". As you can see, Jacques has quite a good selection, but Marge seems a little less talkative. While I really like the set, particularly for the figure of Jacques, the price is simply way too high. I just bought a great TRU exclusive last week, with a bigger playset than normal and four figures, and it only cost $35. To get two figures on one of these tiny sets for $30 is about $10 too much. The good news is that my set had no trouble with the pegs. Let's hope that keeps up. 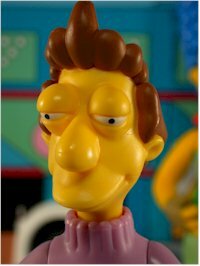 Also, Jacques is terrific, and this is a cool Marge variation. Unfortunately, the tiny size with the big price tag hurt the overall score. 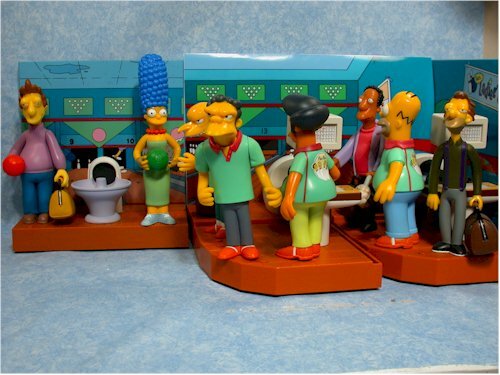 I've included a picture below of the double wide customized Bowlarama with the new set, to give you some idea of how they will look all together. This is a TRU exclusive, and they are hitting stores right now.